The first half was an extended, hour long duet by Jason Moran and Robert Glasper and it was mesmerising. It wandered through a whole range of styles. I am not sure whether it was an actual composition or whether they had a structure and improvised within that. Either way it was gripping. What also came across was how much fun they were having, that is something you can't see with a recording, you only get that with a live performance. After the interval an all-star sextet took to the stage after the interval: Glasper was joined by Marcus Strickland (sax), Ambrose Akinmusire (trumpet), Lionel Loueke (guitar), Kendrick Scott (drums) and Derrick Hodge (bass). London Jazz News again: "The concert concluded with Message of Hope from Hodge’s first album as leader, providing a fitting, almost spiritual end to proceedings. With artists this talented, collaborating as well as they did here, it’s clear that the future of the label is in good hands. An exceptional evening which gave proof - if any were needed - that Blue Note is in rude health at 75 years old." I would second that - an excellent and thoroughly enjoyable concert. My brother-in-law is a big fan of John McLaughlin; he and my sister booked early and had managed to get front row seats. We were a little slower off the mark and were back in row MM. We met up for a meal beforehand in The Archduke a short stroll from the RFH. I cannot go to the Archduke without remembering the time I went there with a crowd of colleagues from BIS (Applied Systems) for a team outing. We were all horribly hungover the next morning and I mean everyone, even the hardened drinkers. We were all well used to session drinking and knew our limits but this was qualitatively different. I am quite convinced we drank adulterated wine as it was the time of the "anti freeze in wine scandal". You may mock but I am convinced. For us all to be that unwell was unique and never repeated. I really enjoyed the support act Hedvig Mollestad Trio who belted out an eclectic mix of styles. At one point even I thought I heard a riff reminiscent of T.Rex's Twentieth Century Boy. Plus it doesn't do any harm for a band to be fronted by a woman with long blonde hair and a short red dress. After the interval it was the turn of John McLaughlin and the Fourth Dimension. As the lights went down we saw the Hedvig Mollestad Trio tip-toe into seats a couple of rows in front of us. An evening of culture, a night at the opera, and not the Marx Brothers' film but a bit of Mozart. This performance was by Opéra de Baugé, a visiting company, for one night only. Their take on this was to transpose the setting to ante-bellum America. The Duke becomes the plantation owner and his power over the slaves echoing, if not exceeding that of the Duke's "droit du seigneur". I did not know it was a comic opera (I thought Mozart was proper, serious music); it more resembled the Bryan Rix school of low comedy, there was everything except the vicar with his trousers down. So you get sublime music with some good laughs thrown in. At one point the young swain Cherubino (on the right of the photo) disguises himself in women's clothes. Apparently this role is normally played by a woman so here we have a man playing a woman's role dressing up as a woman who is normally a woman playing a man dressing up as a woman. Hmm. I am not much of an opera buff, in fact I am not an opera buff in any way shape or form, but I thought the singing was good and our friend Kate who came with us and sings and knows about this stuff averred the same. If you want a bit of culture you wouldn't go far wrong with this and in the excellent setting of the Rose Theatre. We ate beforehand at the Cork and Bottle wine bar which I have been going to since 1980. On a previous visit I mentioned this to our wait-person who remarked that that was before he was born! The Lounge at the Leciester Square is one of the smallest venues I have been to for a while, in a good way. You are really close to the stage so can get the full impact of the performance. The reviews were in the vein of "damning with faint praise" but we thoroughly enjoyed it so what do they know. Since it was a short walk and a short performance we had ample time to return to C&B for a night cap afterwards. The British Theatre Guide wrote. 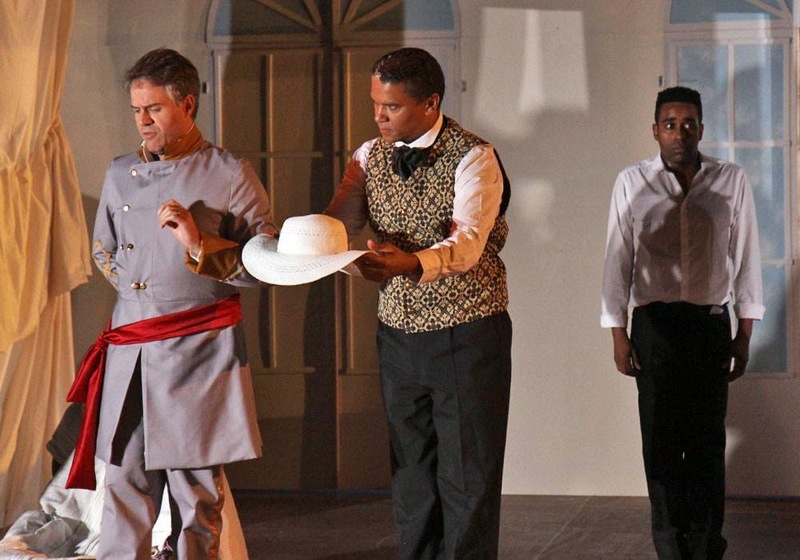 "Fettes's and Alexander's obvious differences are clear and deliberately exaggerated to great effect from both, which helps keep the audience hooked in the few moments of uninspiring madness. What is more captivating and impressive is the delivery of Stevenson's character. A somewhat mad eccentric incapable of lying, this is a gold star performance which brings to life a top notch, deeply flawed and interesting character. 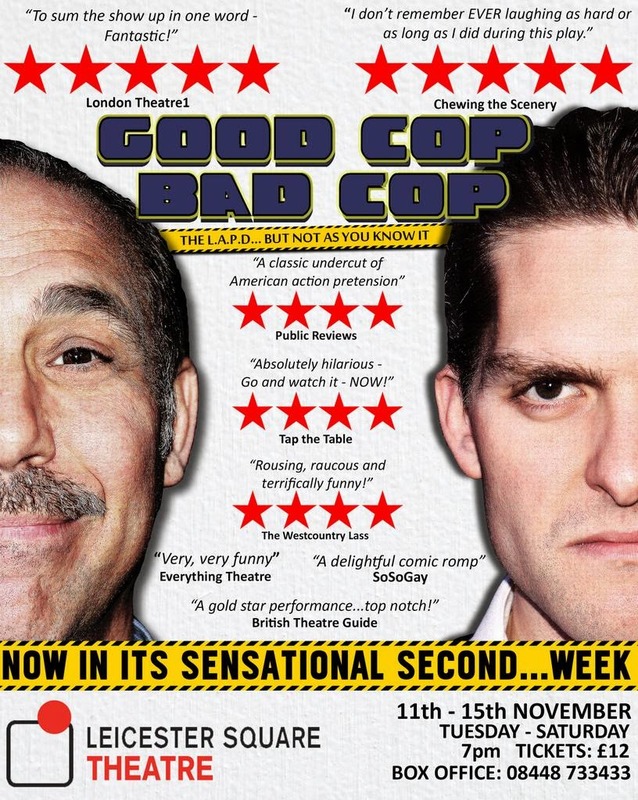 Initially, Good Cop Bad Cop starts off as a simple plot with little scope, so it was reassuring to see it develop. This is a great attempt from this writing trio at trying to push the boundaries and create a new edgy, funny play capable of its West End billing. " "The performances here are all decent enough – Stevenson in particular deserves credit for an endearingly spaced-out turn as Joe, which at least serves to confound expectations of how the detainee should behave in this well-worn paradigm. They cast might be better served by the script, however, if it were boiled down considerably to form a much tighter (and much shorter) sketch." We had an unexpected change of plan thanks to a friend on FaceBook alerting us to this event. 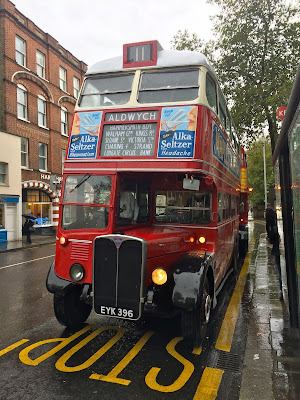 We abandoned our intention to walk part two of the North Downs Way and, instead, went for a ride on the buses. 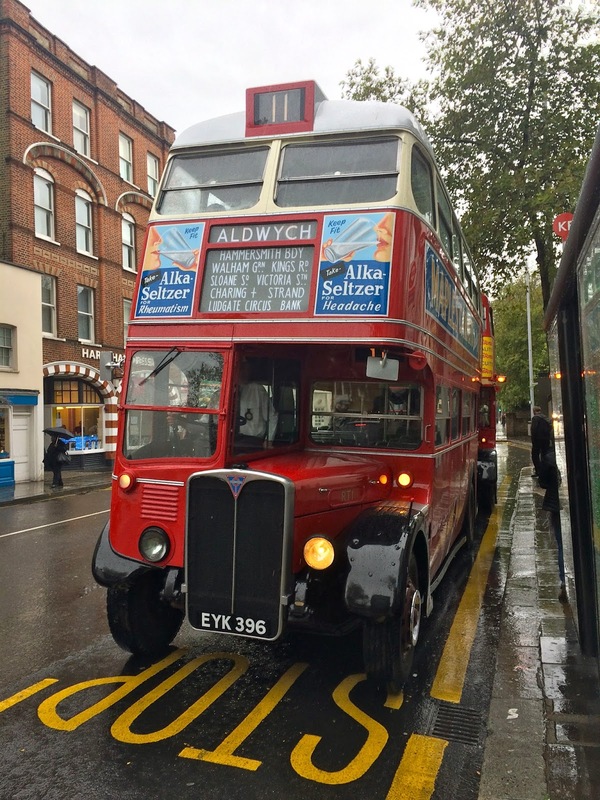 Route 11 is London’s most famous bus route, passing the Bank of England, St Paul’s Cathedral, Fleet Street, Strand, Trafalgar Square, Whitehall, the Houses of Parliament, Westminster Abbey, Victoria, Sloane Square and Chelsea’s Kings Road. 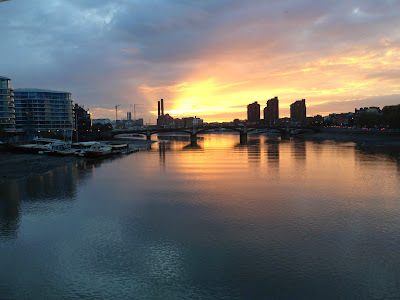 We walked along the Thames Path and over Hammersmith Bridge to the bus station at Hammersmith Broadway where we awaited our transport of delight. Part way through the journey we caught up with the prototype RT1. 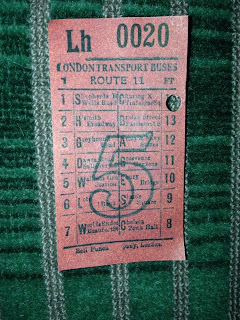 We swapped buses and paid the five pounds to ride on this original - all the others were free - and well worth the money to go on a piece of vehicular history. 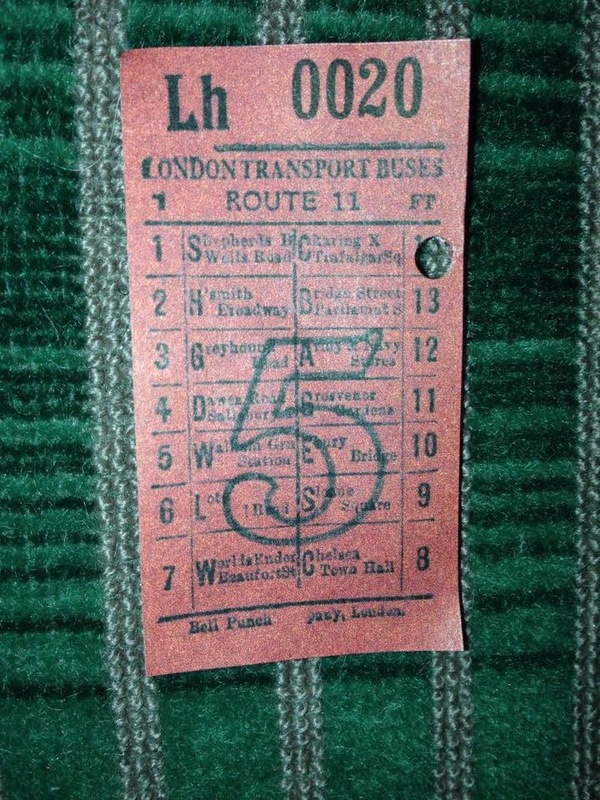 On the RT1 you get a proper conductor and a bus ticket. A sign you do not see on modern buses. We rode as far as Strand to buy me new Ecco walking shoes and then caught a different RT bus back to Sloane Square for more shopping. From Sloane Square we walked back home via Albert Bridge and an atmospheric sunset. "We like to drive in convoys - we're most gregarious. The big six-wheeler scarlet-painted London transport diesel-engined 97-horsepower omnibus." A day far more fun than I had expected. Hold very tight please! Ting-ting! The final visit each year is closing up Trullo Azzurro for the winter and harvesting our olives. I had been hoping for a good harvest this year but the weather had other ideas. Up till now the harvest has alternated between, typically, 35 kg and 90 kg. This was due to be a good year but the summer had been very wet and the olives were very poor quality - a combination of mushy fruits and damage caused by insects encouraged by damp conditions. We did not know this at the time and harvested as per Plan A. We lay the nets down and raked the olives using fingers, hand rakes or rakes on poles. We then 'herded' the olives into the crates picking out the leaves and lumps of clay. We ended up with about 35 kg of olives. We then took them round to our friends to add to their harvest for pressing together and then learned the bad news; they were thinking of not even bothering to harvest as the quality was so poor. We had already paid for hold luggage on RyanAir so we went round to the local olive press and bought 10 litres of this year's harvest to bring home as a consolation prize. It was an opportunity to show our friends the presses at work - starting with the minimum 220 kg that you need to get olives pressed (which is why we need to put our smaller harvest in with our neighbours). The traditional cold press process starts with grinding the olives, stones and all, into a gritty pulp; the millstones are just visible top left. The pulp is then layered between raffia-type, circular mats. When sufficient matts are piled up the whole lot is put under a hydraulic press and the oil is slowly squeezed out. The oil is then stored in stainless steel cans that look remarkably like milk churns. The rest of the weekend went as planned - lots of vacu-sacs filled with linens and duvets keeping them dry for the winter and general tidying. We also discovered an excellent new trattoria thanks to a recommendation from our friends Chris and John: Il Cortiletto a short drive away in Speziale near Fasano. We managed the full anti-pasti, primi, secondi and dessert and they were all excellent. Thursday and Friday were very wet, Saturday morning stayed dry for the harvest and Sunday was lovely - we had breakfast and lunch outside. We were sorry to go home and the next trip is Easter to open up for the 2015 season. For our 21st wedding anniversary the nice people at BluesFest London had laid on a programme of concerts for us. We orginally booked for the main evening performance but when we learnt that Marcus Bonfanti was playing we added on a stroller ticket and took the afternoon off work. First on in the Elgar Room were Dr Feelgood who belted out some good ol' rock'n'roll. Robert Kane makes an excellent front man giving it plenty of energy. Then Marcus Bonfanti who we have seen now for the eighth time. Seeing someone that many times you get to see different styles of performance from the wonderful acoustic set at Green Note Cafe to the raucous rock star version last year at Blues Fest 2013. This was slightly to the gentler side of centre. For the third session we saw a little of the Matt White Trio in the appallingly unsympathetic venue of the Verdi room. We listened to a couple couple of songs then bailed in favour of The Excitements in the West Arena Foyer. A good call as they belted out some Rhythm 'n' Blues and Soul. The lead singer's style was a mix of younger versions of Aretha Franklin with a bit of Tina Turner thrown in. Supper was in the Coda Restaurant. The waiter asked if we had been there before - "Yes, exactly one year ago for our last wedding anniversary". 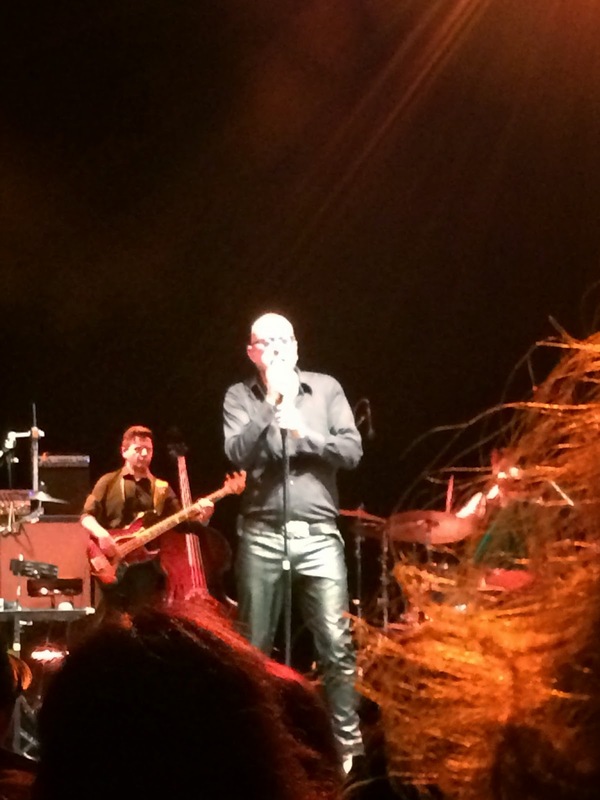 After the interval was Californian singer-songwriter Beth Hart\ about whom we knew nothing. We had come to see Robert Cray unlike the guy in the seat next to us who had come to sees Beth. She was good but not good enough to hold us to the very end - we were both feeling tired so we sneaked out before the end and grabbed a black cab home. We had been recommended Mario Biondi by our musically inclined friends in Italy who described him as an Italian Barry White. Mary was visiting her Mum in Scotland and came straight from City airport to meet me at the nearest tube station and thence to Cabana Brasilian Barbecue for a very tasty pre-concert meal. Empire doors opened at 7:30pm but we had checked online and Mario was not due on to 8:45 so we had a leisurely supper - I hate rushing my food. As it turned out we even got to see that whole of the support act Mozez. Stalls seating was unreserved but we got really good aisle seats not too many rows back. I attribute this to people not bothering with the support act. Their loss as I thought Mozez were pretty darned good. The audience was full of Mario fans who wanted to dance. After the first few numbers people were up out of their seats and dancing away. I don't do dancing. Watching these people making an exhibition of themselves makes me realise how uptight I am. Just call me Mr "Poker up the arse" - I am unable to enjoy dancing especially in public. I know the theory that they are actually enjoying themselves but I have trouble believing it. Because I am so self conscious I cannot comprehend their behaviour; I can only conclude that they are desperate attention seekers - which is patently not true. Another thing that struck me was how easy it is to forget to give the band full credit. So often the concert is all about the star but the sound you go to hear is much more than just the singer. The band is as important to the sound you have come to enjoy. Mario's band were very good indeed.